to encourage students to consider studying physics at UTRGV. The Research Poster Contest will provide local area high school students with an opportunity to work with faculty members from the Department of Physics and Astronomy to explore potential careers in science. Starting in November students will work on the posters under the supervision of the physics faculty members. The students must be nominated to participate in the contest by a science or math teacher. Each school can nominate up to six students. The top three students on the nomination form are guaranteed a place in the program, and other students will be allowed to compete if there are available projects. Teachers, please list the students in order of likelihood to commit to the contest. Students will choose a project that falls within the broad areas of Astronomy, Astrophysics, Biophysics, Materials, Mathematical Physics, and Nanophysics. Each project is sponsored by a faculty member currently researching and publishing scientific papers in that area. On the student nomination form students should indicate their top three preferences for project topics. Every effort will be made to accommodate the student preferences, but it is possible that a student will be assigned a project that was not listed as a preference. To promote creativity and independent thinking, we require that posters are made by individual students (that is, no team posters). The poster topic, design, and presentation must be the original work of the student entering the competition. Students will be able to print the posters at UTRGV. The competition will take place on Saturday December 5, 2015 4-6pm in Cavalry Hall at UTRGV, Brownsville campus. 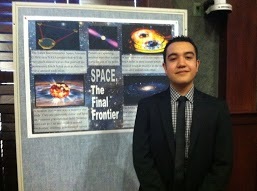 The top three student posters will be nominated for a full scholarship intended to cover their expenses for their undergraduate studies in the Department of Physics and Astronomy at UTRGV. Teachers send nomination forms: until November 2, 2015. Final list of students accepted to the competition: by November 6, 2015. Presentation day and award ceremony: Saturday December 5, 2015 4-6pm in Cavalry Hall at UTRGV, Brownsville campus. By November 6 the teachers and students will be notified about the project assignments. The judging and award ceremony will take place on Saturday, December 5 from 4-6pm in Cavalry Hall at UTRGV, Brownsville campus. Students, classmates, teachers, mentors, and parents are all invited. Students: Review the list of Project Topics. Student name, email, phone number, and top three topic choices. Teachers will send nominations to the organizing committee. The first 3 students nominated will be automatically admitted to the competition; for the others their admission depends on availability of mentors.